Researchers calculate all the photons ever emitted by the observable universe and find an astronomical number. (Inside Science) -- Scientists may have for the first time measured all the starlight ever produced in the observable universe, a new study finds. All the ultraviolet, visible and infrared light that galaxies have emitted over the course of the universe's lifetime -- the so-called extragalactic background light -- has long been extremely difficult to measure, because some galaxies are too faint or far away for any present-day telescopes to detect. As such, researchers were forced to estimate how much light distant galaxies emitted. Now, by analyzing how gamma rays, the most energetic form of light, could transform into matter, scientists have for the first time directly measured the extragalactic background light (although their calculations still require some assumptions). They detail their findings in the Nov. 30 issue of the journal Science. "It's like following the rainbow and discovering a pot of gold," said study lead author Marco Ajello, an astrophysicist at Clemson University in South Carolina. "The extragalactic background light is the rainbow and its knowledge can finally disclose a lot of useful information." The scientists examined gamma rays from blazars, which are galaxies with supermassive black holes that can release narrow jets of plasma traveling at nearly the speed of light. When one of these jets is pointed directly at Earth, astronomers can see it even when it comes from extraordinarily far away. Gamma rays generated within blazar jets may eventually cross paths with photons of extragalactic background light. As Einstein's famous equation E = mc^2 revealed, matter can convert into energy and vice versa, so when photons collide, their energy is sometimes converted into mass, creating new particles in the process. Although low-energy gamma rays do not interact with photons from the extragalactic background light, high-energy gamma rays might, forming pairs of electrons and their antimatter counterpart, positrons. The quantity of low-energy gamma rays from a blazar help researchers know how many high-energy gamma rays they should expect to see. By comparing the expected and detected high-energy gamma rays, the scientists could estimate the density of the extragalactic background light, said study co-author Kári Helgason, an astrophysicist at the University of Iceland at Reykjavík. The researchers examined almost nine years of data from the Fermi Gamma-ray Space Telescope on gamma rays from 739 blazars. By analyzing blazars near and far away from us, the researchers could deduce how much starlight existed at different points in cosmic history, since the farther light has traveled, the further back in time it came from. Based on these findings, the scientists estimated all the starlight ever produced amounts to about 4 * 10^84 photons -- that is, a 4 with 84 zeros behind it. In comparison, the sun currently emits about 3 * 10^52 photons each year, while the cosmic microwave background -- the haze of radiation left over from the Big Bang -- is about 10^90 photons, Ajello said. However, because the universe is extraordinarily vast, the sky still appears largely dark at night. All in all, the researchers were able to reconstruct how the extragalactic background light evolved across cosmic history. Scientists think the universe was born from the Big Bang roughly 13.7 billion years ago and began life within a hot brew of ions, or electrically charged particles. A few hundred thousand years later, these ions cooled into neutral hydrogen gas. The universe stayed dark until gravity pulled matter together into the first stars a few hundred million years after the Big Bang. Previous research suggested the intense ultraviolet rays from stars and galaxies that formed and shone during this epoch caused this murky neutral hydrogen to reionize, enabling their light to shine freely through space and for us to observe them. The new findings support previous estimates of star formation history and suggest that prior work based on visible and ultraviolet light did actually see all the galaxies composing the extragalactic background light that were near enough to see, said astrophysicist Elisa Prandini at the University of Padua in Italy, who did not take part in this research. The new findings also yield insights on how many galaxies existed in the early cosmos. 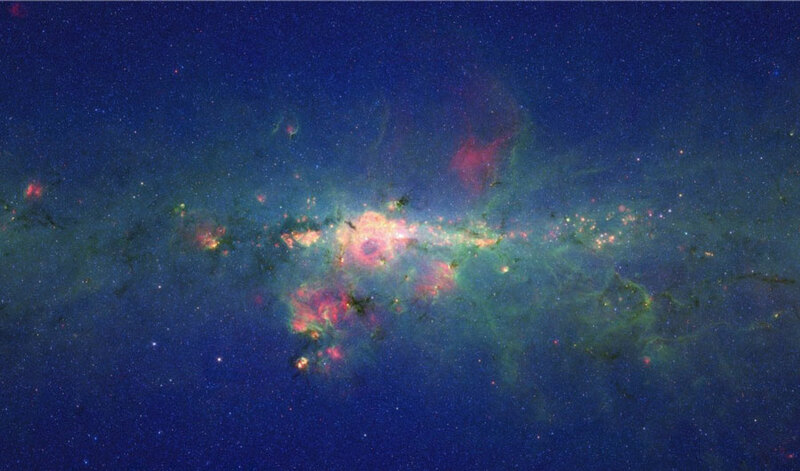 They reveal there were indeed enough to produce enough UV light to help explain the so-called "epoch of reionization," when the universe emerged from its dark ages, Ajello said. "We measured the density of faint galaxies in the first billion years, showing that indeed they emitted enough photons to reionize the universe," Ajello said. In the near future, this gamma-ray data may shed light on other cosmic mysteries, such as the dark matter and dark energy that make up most of the universe, Prandini added.